Last edited by John Van Vliet on 26.05.2008, 21:40, edited 1 time in total. Thanks very much for your efforts here. who told you the height map data on Io? How did you make your height map? Last edited by John Van Vliet on 26.05.2008, 21:41, edited 1 time in total. John, even if your normal map is an artistic invention, it looks nice, at least for me, so I appreciate it very much, as you can see in the images here below (BTW, I'm mosaicing your 8k VT level3, in order to obtain a single 8k image. I've done 1/4 up to now, and that's what is shown in the images). but imagemagick will convert it to a 16bit .gray that nms ( texture tools ) can remake into a new normal map. Wow John, a light speed reply, thanks a lot. and I'll work on it to search this result. Surely I need more information on normalmaps, so I'll search for them. But you say that you have already a 50% height map available, correct? Is it the full 8k or it's the VT 8k? Anyhow, whatever it be, I would be very peased if you make it available, thanks a lot. andrea wrote: (BTW, I'm mosaicing your 8k VT level3, in order to obtain a single 8k image. I've done 1/4 up to now, and that's what is shown in the images). Regarding the texture, it's not your 8k one, this is the reason of the different color. It's not Steve Albers' 4k Io texture, but from someone else, don't remember who, my fault. I think that the correct color is more yellow and less dark. Last edited by John Van Vliet on 26.05.2008, 21:42, edited 1 time in total. Thanks a lot, John, very appreciated, I'm downloading just now. I'll show final results tomorrow. John, here is the result. The first image shows Io with your 50% reduced height 8k normalmap, the second one with the full height 8k normalmap. IMO the first image is much better than the second one, do you agree? Last edited by John Van Vliet on 26.05.2008, 21:43, edited 1 time in total. john Van Vliet wrote: just for comparison .The orig. may have to much height ,on some fetchers, but the reduced one has to little. John, as this is an artist's concept, it's a matter of personal taste, IMO. But have we got any idea on real elevations data on Io? I doubt this, so I prefer the lower features (but as I told it's my personal taste). Anyhow, you did a big work, very appreciated, I'll use it in my Jupiter show. 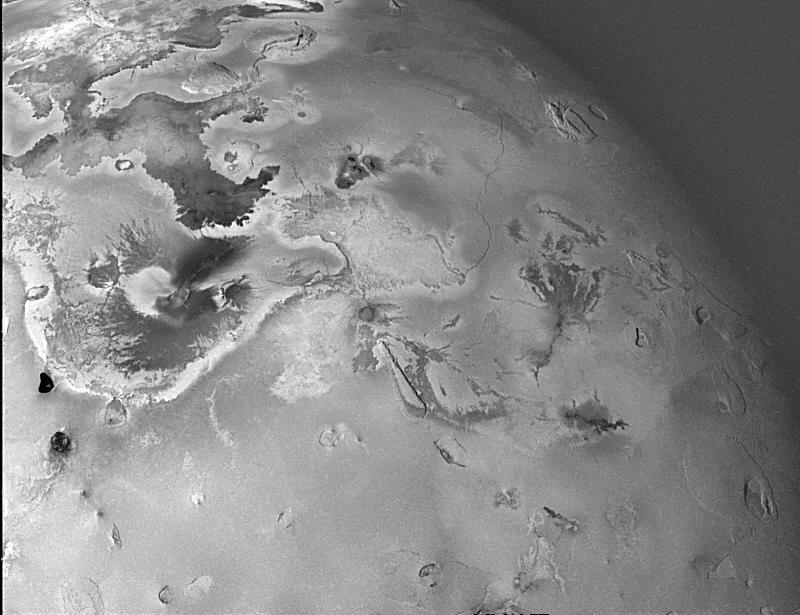 john Van Vliet wrote: But have we got any idea on real elevations data on Io? Much of Io is very flat on the global scale. There is the occasional 250-500 m tall scarp that cut across the flat landscape (see http://photojournal.jpl.nasa.gov/jpeg/PIA01105.jpg above and to the right of center, running north from the eastern tip of the bright white eagle-shaped feature at center, for an example). This flatness is broken up by the occasional mountain (these can reach 17 km in height) and the occasional volcanic depression (250 m-2.5 km in depth, normally). Very little topography is associated with the lava flows. Most of these flows are 1-20 meters thick, much too thin for topography to be visible in global or regional views like the ones above. I've been trying to create a bump map based on real elevation data (which I've found for at least one mountain) or at least try to artistic produce mountains that match actual data. An artistic way to do this (without going through the tedium of drawing the elevation data in Photoshop) would be to have a flat Io with the occasional shallow, but steep-walled depression, and occasional mountain (which generally are steep sloped with one shallow slope). unfortunately, neither approach looks anywhere convincing to me. John's may look pleasing, but has little to do with Io. If you model isolated 17km mountains at an 8bit graylevel in an elevation map, you get these abrupt steps that are also visible in your images. A modelling with such large differences in elevation can only be done smoothly at the signed 16bit <=> +- 32768m resolution level. My normalmap tools (nmtools package) are designed to work with signed 16bit input elevation data. If you are using information from DEM's I wonder why you are not using a more professional approach, like e.g. ISIS3, where all these requirements are implemented. I can't get the bump map. The link doesn't work.